Embossed with signature RL 67 logo on bottom. Each, 3.25"Dia. x 7"T; holds 16 ounces. Four-piece champagne glasses set. Made of glass with nickel-plated stems of iconic buildings. Buildings Include: Eiffel Tower, Empire State Building, Chrysler Building, Big Ben. Holds 8 ounces each. 2.5"Dia. x 10.75"T. Hand wash. Imported. Mouth-blown glass opalescent cordials. Engraved, "pepita" pattern etching. Set of two in gift box. Each will vary slightly. 3"Dia. x 4"T each. Hand wash. Imported. Heritage-inspired highball glasses accented with a sandblasted design of Ralph Lauren's signature polo pony. Made of 24%-lead crystal. 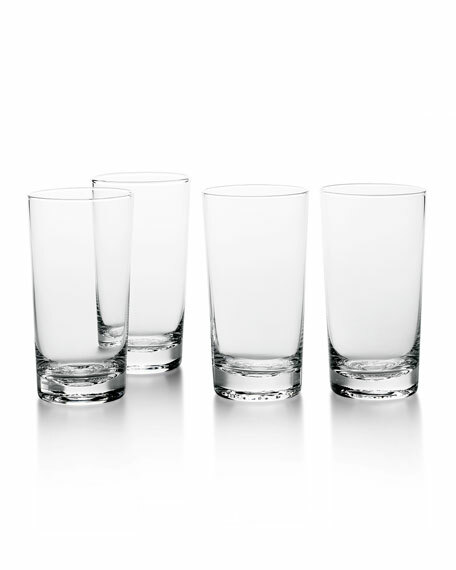 Hand wash.
Heritage-inspired highball glasses accented with a sandblasted design of Ralph Lauren's signature polo pony. Made of 24%-lead crystal. Hand wash. Set of two; each measures 3.25"Dia. x 6"T and holds 16 ounces. Imported. Inspired by one of Mr. Lauren's personal desk lamps. Contemporary engine-turned design. Made of 24% lead crystal. Set of two; each measures approximately 3.5"Dia. x 4"T and holds 12 ounces. Made in the Czech Republic.